Chodesh Kislev tov, everyone. Woo hoo! 25 days until Chanukah! I have no deeper thoughts than that at the moment, but maybe I will if I get some sleep this weekend...? One can always hope. 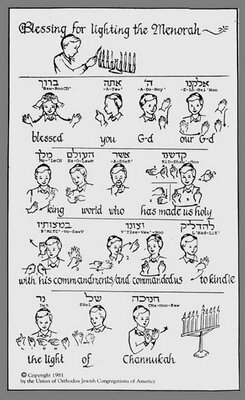 Enjoy the directions for lighting Chanukah candles in American Sign Language, to the left here, couresy of the Union of Orthodox Jewish Congregations (most commonly known as the "OU," the people who supervise food production and then put kosher symbols on packaged food).